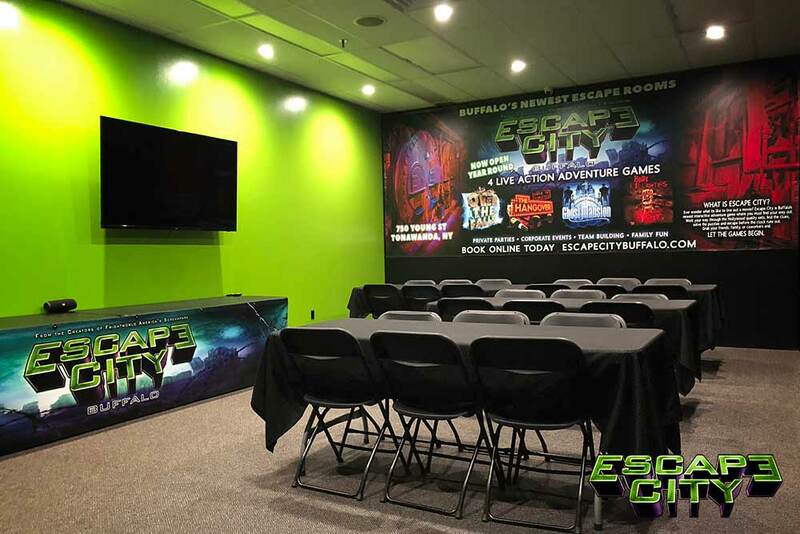 We are excited to announce the opening of our VIP Private Party Room here at Escape City Buffalo. Do you want an event that everyone will be talking about for years to come? Celebrate with us! We welcome private events of all sizes and types. Whether it be for a corporate event, team building, mixer, birthday, bachelor/bachelorette, wedding party event, holiday party or any other commemoration, our spacious private room is the perfect venue. When it comes to team-building activities and escape rooms, Escape City Buffalo has a way of providing high-impact learning experiences on an individual level as well as a team level. Our escape rooms can increase team skills, communication and help improve morale and productivity. is the process of turning a group of individual employees, friends or family into a cohesive team, a group of people organized to work together interdependently and cooperatively to meet the needs of their customers by accomplishing their purpose and goals. Employees, friends or family benefit through experiencing a sense of accomplishment in working as a group to complete a challenging task and learning ways to improve communication skills. Team Building in the workplace significantly contributes towards employee motivation and building trust among the employees, thereby ensuring better productivity. These are some common team building exercises for communication, success and improved team performance and our escape room is perfect scenario. A team that works well together, understands the strengths and weaknesses of each team member. One of the benefits of strong teamwork in the workplace is that team leaders and members become proficient at dividing up tasks so they are done by the most qualified people. Not only is our private room perfect for team building, but also your own private parties. We have catering options to meet you and your guests needs. Along with catering options, you will also receive a host or hostess to help make sure your event runs smooth. Our private room also includes clean up; so at the end of your party, you get to walk away and we will handle the rest! When it comes to the workplace, socializing and making friends in the workplace is one of the best ways to increase productivity in the office. Not only does it increase morale in the office, it also allows for the office to work better solving everyday workplace issues. After any sports team wins a major championship, they celebrate and have fun. This motivates them to want to win even more. This extreme example shows that the celebration, cheering, and fun that comes with every team building event can motivate employees to bring their motivation to the next level. People tend to have a larger imagination when they are around people they are comfortable with. So, successful team building events not only bring people closer together; but they also lead to more successful and creative workplace ideas. Competition has been shown to increase production. So, by channeling that increased production into a fun, inclusive team building activity; employees can bond in a way impossible by other means. Communication and working better together is the top reason why people choose team building. Everybody wants a friendly work environment, where people are comfortable and happy to talk to and work with. One of the best reasons for team building is that the activities actually work to accomplish improved communication. We specialize in team building events, large parties, and event planning so your party is in great hands. Contact us today to get your party started.